Feel free to offer any steers on where else I mighty need to go. Please bear in mind that my work-rate is inversely proportional to home command commitments so don't expect a quick turn-round! Nose strut is ridiculously fragile. I am currently building this kit as a Japanese aggressor. Look for my WIP "Building Japanese ". Probably you will want to reposition the ailerons. New exhaust cans for sure. 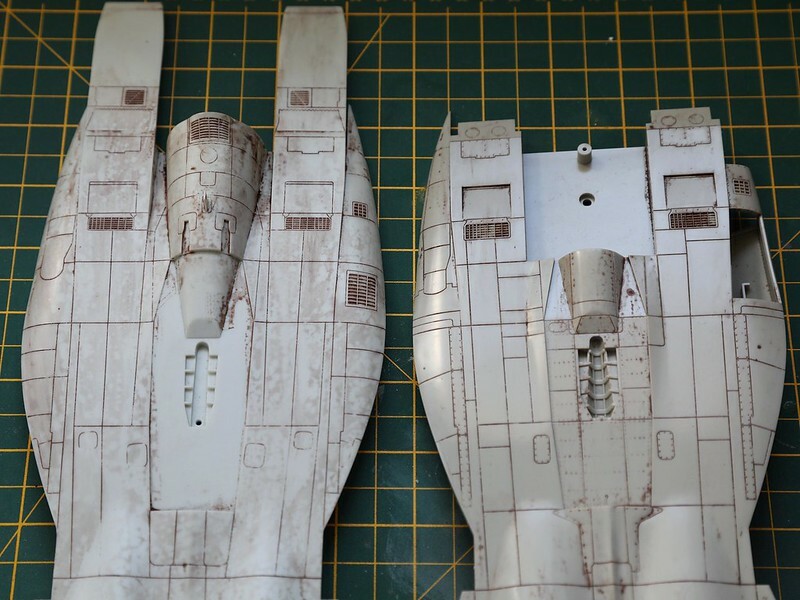 Extra detailing on the canopy, also you will have to add a bulkhead to the aft end of the canopy. Seams in the intakes will be a pain. Make sure to paint the fuselage area between the intakes before glueing the nose to the main body. Kit decals will be 35 years old and seem to have lots of excess glue when dunked in water. Seats need to be replaced. Cockpit tub is ok. The issue I had came with smoke tinted canopy & windscreen, but as I recall, not all the issues of this kit came that way. And good luck with it! Both versions of the -15 from Revell are pretty good; they just need refining in the usual areas. Many thanks for the steers chaps, much appreciated. I'm going to do this one in flight (again), it avoids the undercarriage issues but then you have to put aircrew in the jet and try to paint them realistically! Dan - following your build with interest, the width of the replacement seats is definitely an issue. Here are some seats for comparison of the problem. 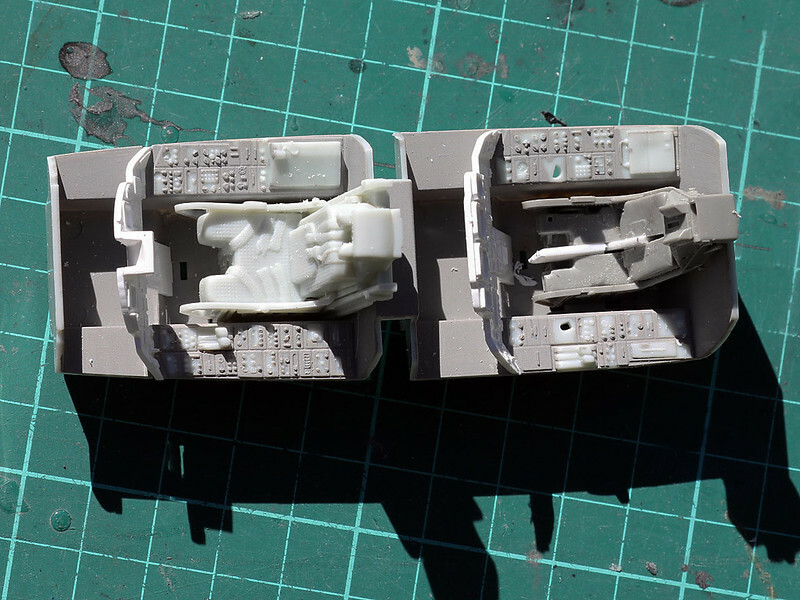 From left to right Aires Aces (with pouring block still attached), Aires Escapac and Revell Aces. 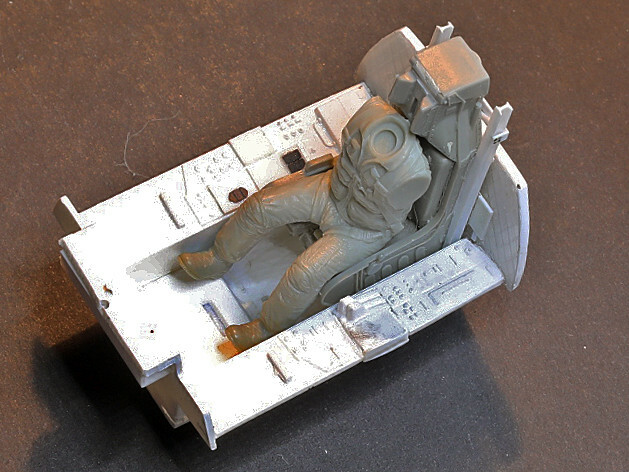 Even without the launch rails the Aires seats look undersized (although I suspect the Revell one was made bigger to fit the cockpit). You will notice a slight modification to the Escapac seat which consists of a wedgey to widen the bottom of the seat. This performs 2 functions, it makes it look wider in relation to the cockpit side instrument panels and wide enough to fit the Tamiya's pilot I'm intending to sit on it. I must admit I wasn't brave enough to completely slice the seat in half and the mod will eventually be hidden by the pilot sitting on it.! This is the Revell tub with the kit ACEs seat in the front and a 'modified' Escapac seat in the back. As you can see the Revell seat is the wrong type for my version and a bit soft on detail but it fits. The Escapac seat is now better but I think I'm still going to have to narrow the cockpit sides to avoid the rather large gap. By the way the cockpit detail is ok but the throttles need moving on the rear cockpit which also has an F-15E IP. 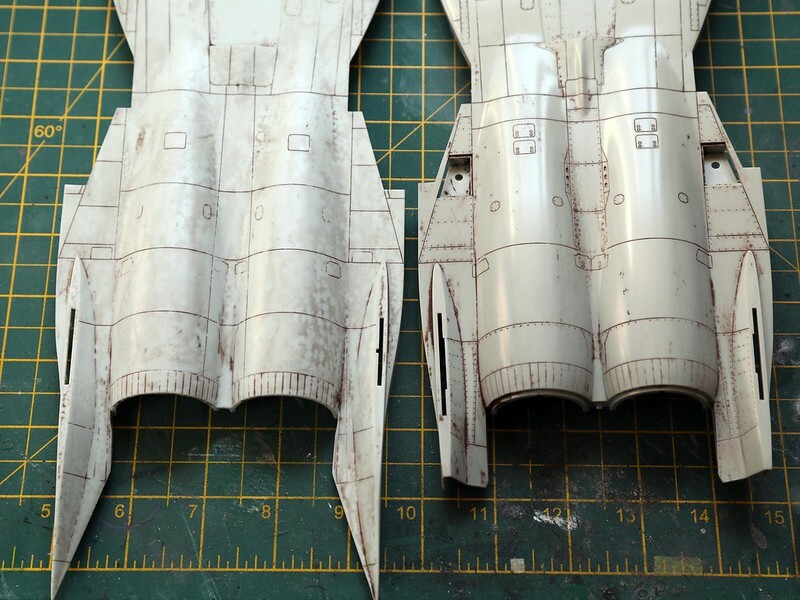 I am also working on incorporating an Aires F-15A front cockpit as the detail is better, particularly on the coaming, and as a bi-product also fits the Aires seat better. 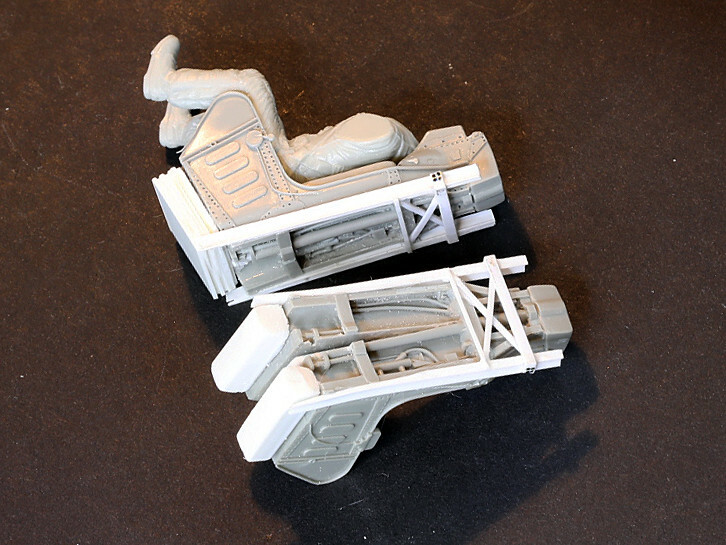 The seats in the Revell kit ARE Escapac seats, not ACES II... And all gear legs are fragile. Bought and built this kit when it came out in the first half of the 80s, and the undercarriage legs were the first to go. Nice project ! If you do a search with "NASA F-15B", you will find my WIP. It shows one way to modify the tub for AM seats ( I used Ares seats). Jens - you are absolutely right, just goes to show how soft the detail is! 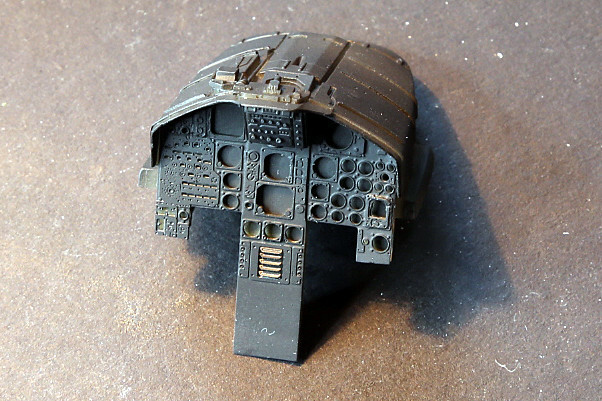 Pascal - Many thanks for the steer on your project, loads of useful tips, especially regarding the cockpit side panels. Did you ever finish this one? Whilst fiddling with the cockpit layout I thought I'd have a look at how much extra detail the Tamiya kit has compared to the Revell one. 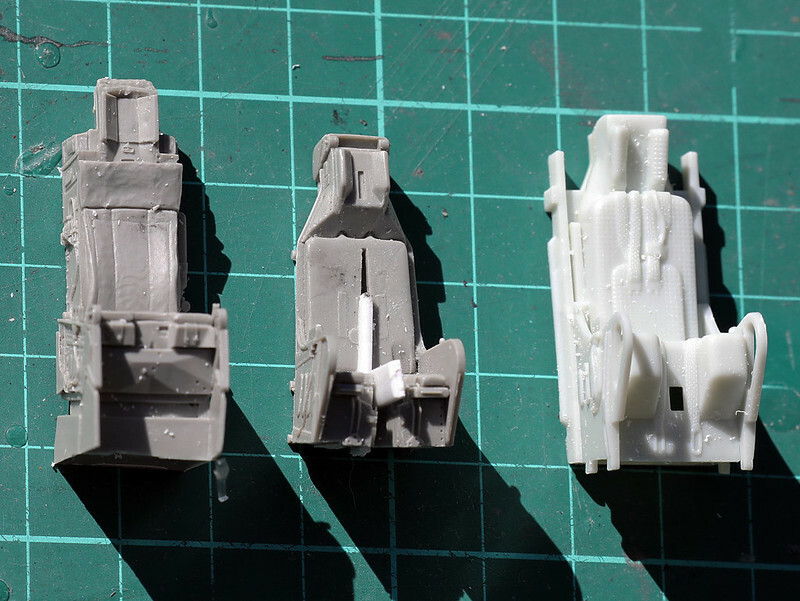 A quick brown wash reveals the Tamiya (on the right) is a smoother plastic and has some riveting detail (although nowhere near the Trumpeter levels) whereas the Revell has none. It also shows some differences on the panel lines so I will have to work out which is the correct one and whether to amend accordingly. 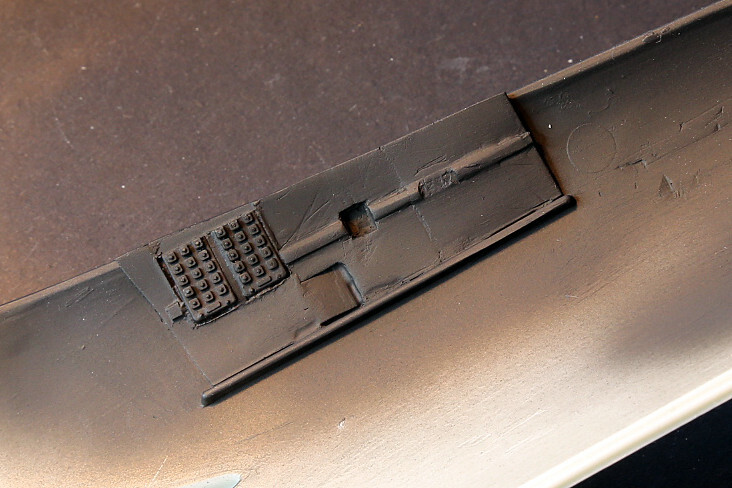 The Tamiya is a 'C' model so there may be some differences that are not on the 'B' ie the airbrake detail at the rear. Overall, not too dissimilar and should respond well to some added riveting detail. 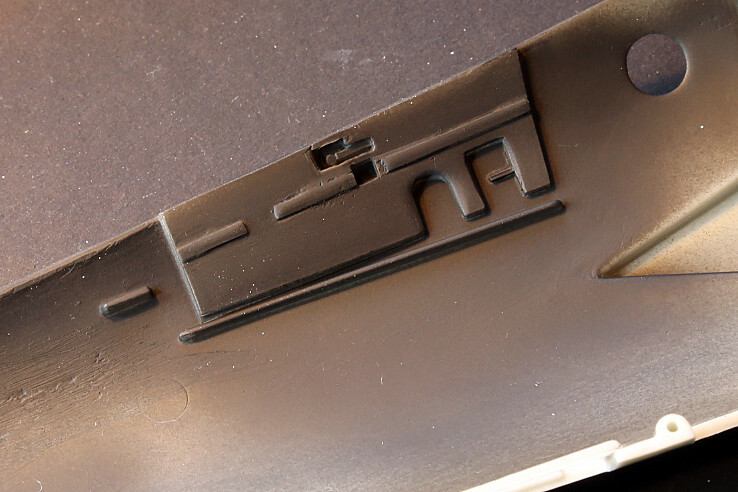 The small gun vent in the Revell kit also appears to be in the wrong place. 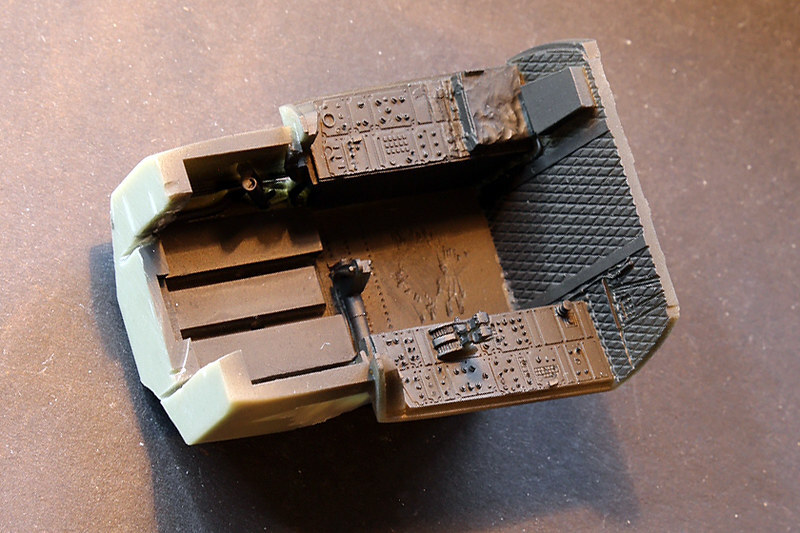 I have the GT Resin vent update set for the F-15 which looks like it should work for the Revell kit though it doesn't include the rather large vent behind the cockpit so I'll have to work out how to enhance this detail. Any more early-B detail references gratefully received! 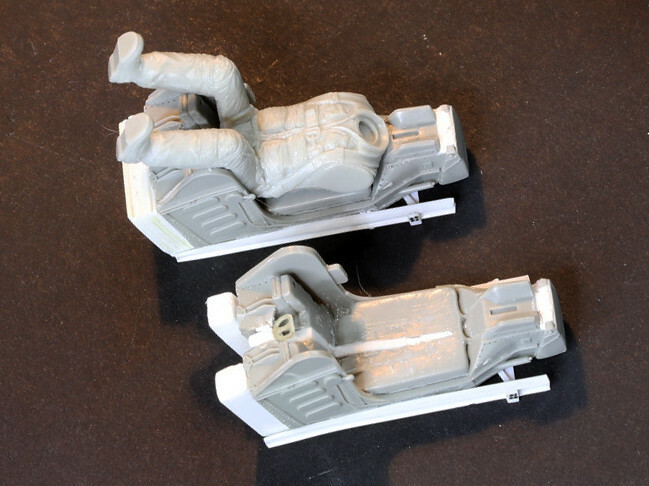 In a brief pause in the festive preparations I've been tinkering with the Aires Escapac ejection seats. Having wedged them slightly wider at the bottom I raised the seat height by a few mm to get the head position right (will need to check this before fixing the canopy in place). I'm not too worried about the finish on the seat as the pilots will be obscuring most of that detail. The pull handle in the head box was removed as these are A-4/A-7 seats and is not required for the F-15. The next addition were the rails and cross-bar supports at the back of the seat. I chamfered the bottom ends to keep the tops parallel and most of this area will be hidden anyway. The main reason for not splitting the entire seat was to preserve the pole detail you can see at the top and rear of the seat. 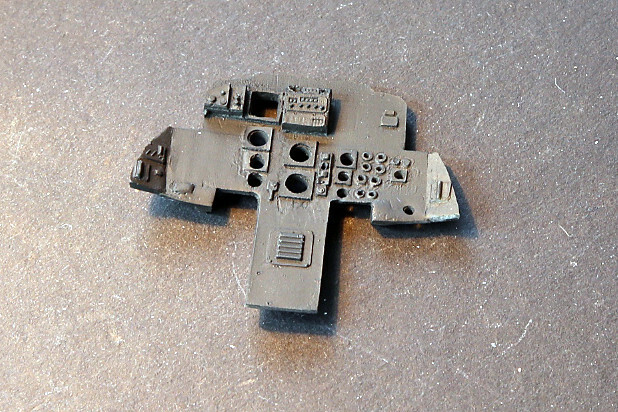 In addition, I've modified the rear cockpit section of the Revell kit to add some rear wall detail, remove spurious instrument detail, reposition the throttles and narrow the side walls by about 1 mm. I'll have to modify the rear instrument panel it doesn;t match the profile of the revised cockpit and it's too wide. With the seated pilot on board the fit now looks a lot more snug. Other items in the cockpit also need attention. The canopy frame below is quite plain and I'm not sure if it is the correct shape either. Hopefully I'll get some time between now and the new year to do some more tinkering but in the mean-time, have a great Xmas everyone and best wishes for a model-tastic New Year! So despite my optimism, modelling time in 2019 has so far been somewhat short and sweet. However, progress (some) has been made and I finally managed to spray something, albeit with black primer! Most of the time has been taken up with tinkering with the cockpit details. 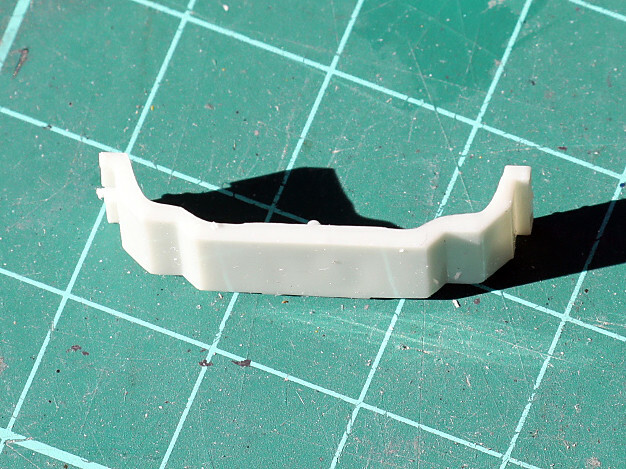 I'm cut-and-shunting the aires cockpit front end to the revell rear end as they seem to be similar proportions. The aires front end is very nicely done, especially when you overlay the PE. The PE is not fixed yet as I need to drill out holes for the IP lighting. I have however drilled out a lot of the resin behind the IP to make this process a bit easier. The main cockpit is again very nice from Aires but I've had to get rid of a lot of resin to make the lighting easier to add. 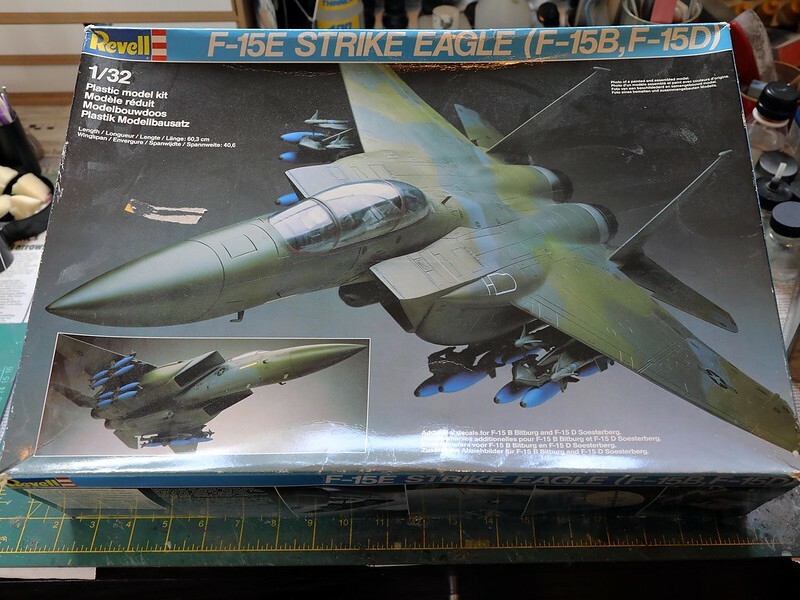 The Revell rear cockpit is based on an F-15E so not really relevant. I've therefore removed a few panels, moved and beefed up the throttles and added some rear wall detail. The rear IP is courtesy of partsrparts and a much better representation of an F-15B IP. I've had to modify the IP somewhat to allow it to fit the narrowed cockpit walls and the side panels I've also decided to add. I've also drilled out the instrument dials in preparation for some lighting effects. The need to trim down the IP edges comes from adding some side wall detail to fill in the gaps from moving the cockpit side consoles inwards due to the seats being too small for the space (or the space too big for the seats). Everyone still with me? 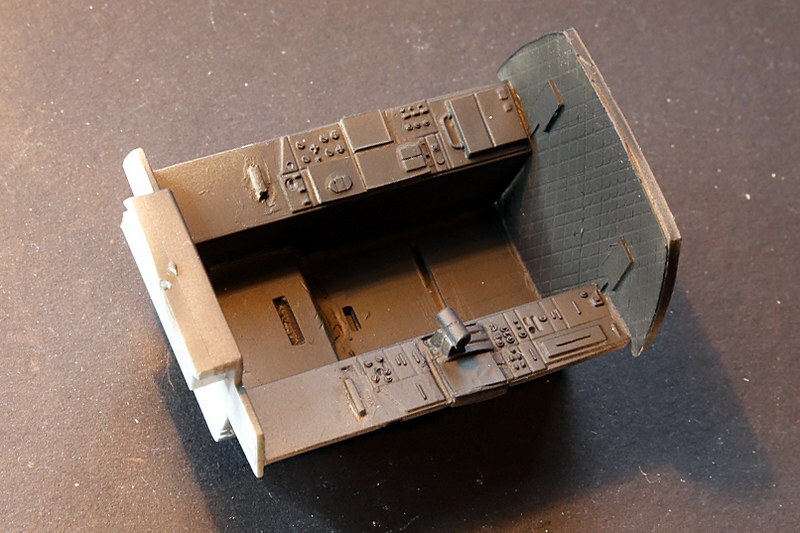 Aires has kindly provided the front cockpit side wall detail, I just have to make it fit the Revell kit. 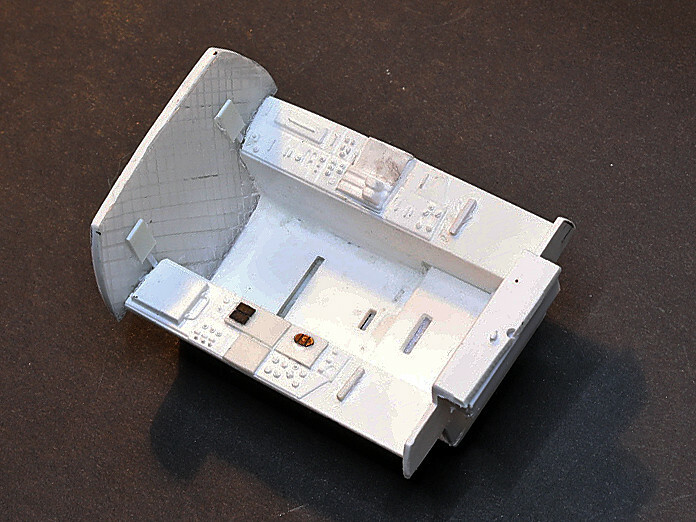 You'll notice the hole for the avionics vent which I am also in the process of scratchbuilding. This one needs some more work apparently (dam this digital photography close up). Still not sure how I'm going to fit this all together seamlessly! Low and slow... It's getting together very nicely! Kei - I agree, one of the reasons I used the Aires cockpit is the better coaming shape and detail. Mongoose - Half the battle is knowing when to stop and photographing them in hi-res doesn't help! F's - Your F-15E paint job is my inspiration for the finish I'm trying for on this bird, but in air superiority blue.